Moscow -Two Russians accused of a nerve agent attack in the UK have admitted they visited the city where the assault took place, but say the purpose of their brief trip was to visit its historic cathedral, and not to poison a former double agent who happened to live there. 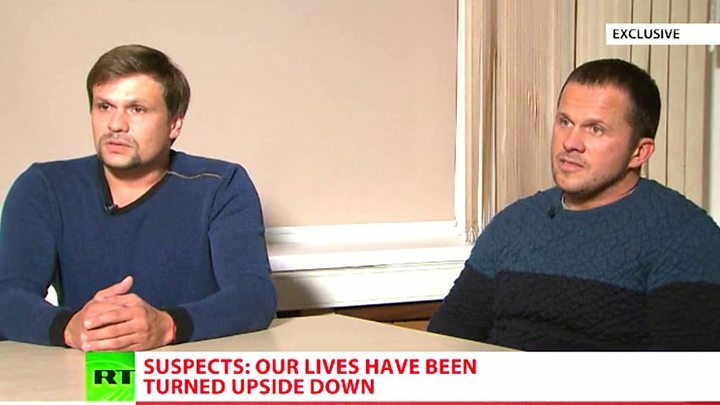 When the men identified as Alexander Petrov and Ruslan Boshirov visited Salisbury in March, the city was in the snowy grip of the harshest winter to hit England in years. But they told the Kremlin-backed RT network that the purpose of their 6,000-mile, three-day trip from Moscow was to visit the “wonderful town,” its fine cathedral and other historic sites such as the ancient stone circle at Stonehenge and the prehistoric settlement site of Old Sarum. Friends had been exhorting them for some time to make the trip, they said. The two men accused of the Novichok poisoning appeared on the Kremlin-backed RT network. They claimed to have had nothing to do with the attack on Sergei Skripal and his daughter Yulia, who were found slumped on a bench as the Russians were on a train back to London. They might have been spotted in the same street as the Skripals’ house, they said, but they had no idea the former spy lived there. Their account appears to indicate that Russia does not plan to deny the time-stamped CCTV footage produced by Britain that shows the pair at various locations between March 2-4 — but merely to suggest it had somehow been misinterpreted, and that there was an innocent explanation for everything. The UK government dismissed the pair’s claim that they were merely civilian tourists. “The government is clear these men are officers of the Russian military intelligence service — the GRU — who used a devastatingly toxic, illegal chemical weapon on the streets of our country,” a government spokesperson said in a statement. British prosecutors said last week they had “sufficient evidence” to charge the two Russian nationals with attempted murder and conspiracy to murder in connection with the attack on March 4. Prosecutors say the Skripals came into contact with Novichok, a military-grade nerve agent. Britain is not applying to Russia for the extradition of the two men as Russian does not extradite its own nationals. However, prosecutors have obtained a European Arrest Warrant and police have asked Interpol to issue arrest warrants too. Russia has repeatedly denied any involvement in the Salisbury attack. London’s Metropolitan Police last week gave a detailed account of the pair’s movements during their trip to the UK, accompanied by CCTV stills that would have been difficult for the Russians to dispute. But rather than being expert members of Russia’s spy service, as Britain alleged, they were simply a pair of foreign tourists on a weekend trip away from Moscow. Yes, they were the same two men shown on CCTV at London’s Gatwick Airport at about 3 p.m. on Friday March 2, fresh from an Aeroflot flight from Moscow. But rather than being on a mission to murder a double agent, their intent was to visit historic sites such as Stonehenge, which is about 10 miles from Salisbury. They did not offer an explanation as to why, instead of heading west out of London, the pair headed in the opposite direction. Eschewing the wide range of tourist accommodations in Salisbury, they favored a basic hotel in the east end of London. On Saturday March 3, police said, the men caught a train to Salisbury, arriving at about 2:25 p.m. They left the city less than two hours later to return to London. Police believe the journey was a reconnaissance trip. Petrov did not dispute the timing. “We came there on March 2, then went to a railway station to see the timetable,” Petrov said, according to RT’s translation of the interview. A CCTV screengrab shows Alexander Petrov and Ruslan Boshirov at Salisbury’s train station, according to London’s Metropolitan Police. A tweet by Stonehenge on March 3 shows the historic site was indeed closed on March 3 because of snow. The two men said they had indeed returned to Salisbury on Sunday, but it was to see the cathedral and Old Sarum because the weather had improved. Police say the men spent less than two hours there. At 1:05 p.m. they were caught on CCTV on Fisherton Street in Salisbury, heading back toward the train station. They boarded a train back to London at 1:50 p.m. The pair passed through passport control at London Heathrow Airport at about 7:30 p.m. before boarding a flight back to Moscow. The weather wasn’t much better there: Photographs from Moscow on March 4 show heavy snow and extensive slush on the city’s streets. Speaking to RT, the two men denied having Novichok or any poison with them. UK investigators have formally linked the attack on the Skripals to the June 30 poisoning of Dawn Sturgess and Charlie Rowley, a couple living in Amesbury, near Salisbury. Sturgess died on July 8 after applying a substance to her wrists from a perfume bottle found by Rowley. Police say it was a counterfeit bottle with a nozzle that had been specially adapted. They believe Sturgess and Rowley, who was sickened but survived, “became victims as a result of the recklessness in which such a toxic nerve agent was disposed of” by the suspects in the Skripal poisoning. According to RT, the two men “sounded distressed” about being named by the UK as Russian intelligence agents alleged to have been involved in the poisoning. The RT interview came a day after Russian President Vladimir Putin said Russia had identified the pair and found no evidence of criminal activities. UK Prime Minister Theresa May told the UK Parliament last week that Britain believes the two suspects to be GRU officers. Russia has been accused by the UK of conducting a disinformation campaign over the attack on the Skripals. Officials from the UK Foreign Office say they have counted 37 different Russian narratives regarding the poisonings in Salisbury.